The spectacular approach of Santorini - Σαντορίνη by sea, usually entering the caldera from the north-west, is the apogee of many yacht charter holidays in the Cyclades. Thira together with the smaller islands of Thirasia and Aspro are part of a volcanic crater, which has been engulfed by the sea. In the centre are the Kameni - Καμένη islets, the cones of later volcanoes which came into being in historical times. Hot springs and emissions of gas bear witness to continuing volcanic activity. The steep caldera cliffs range in height between 200 m and 400 m, while on the outside the land falls away gradually to the sea, its fertile slopes covered with vineyards. Yet, the island is treeless due to lack of water, though the inhabitants achieve a modest degree of prosperity through the export of wine, pulses, pistachios and tomato purée. Santorini also possesses a natural resource in the form of pozzolana , a hydraulic cement used in structures exposed to water (harbour works, the Suez Canal). In more recent years large numbers of visitors have been attracted to the island by its extraordinary natural structure and its excavation sites, which are among the most important in Greece, and the tourist trade has made an increasing contribution to the economy. Also - with the new Vlichada marina nearly finished (see the bottom of this page) - more and more yachtsmen visit this beautiful island. Santorini represents the most active area of the South Aegean Volcanic Arc , which includes the islands of Aegina, Methana, Poros, Milos, Santorini, Kos and Nisyros. Volcanism in this Aegean Arc generally first occurred about 3-4 million years ago with the exception of Kos where Miocene deposits suggest eruptions 10-11 million years ago. 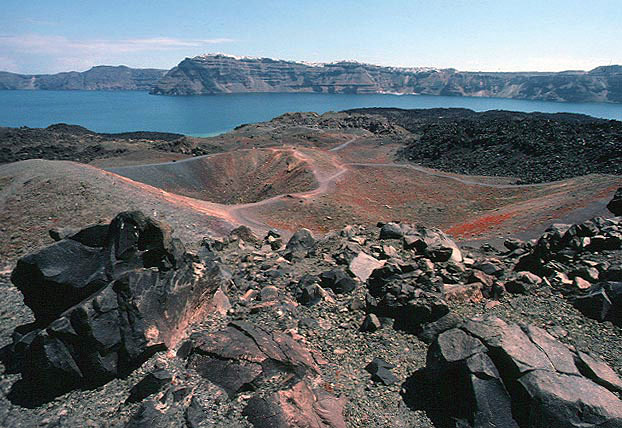 The local volcanic field of Santorini also includes the Khristiana islands 20 km to the southwest and the submerged Kolomvos volcano 7 km to the northeast. Non-volcanic rocks - which are exposed on Thira at for example Mt Profitis Ilias, Monolithos and the inner side of the caldera wall near Athinios - represent a former 9x6 km non-volcanic island similar to the neighbouring Cycladic islands of Anafi, Ios or Amorgos. ca. 2000-500 ka (ka = thousand years back): The oldest volcanic rocks are found near Akrotiri and the Khristiana islands. On the Akrotiri peninsula the up domed areas still are well visible and the marine fossils embedded in the tuffs , suggest a minimum age of 2 million years. ca. 360-1600 BCE: The cyclic construction of shield volcanoes interrupted by large explosive and destructive events like the Minoan eruption at ca. 1645 BCE. 197 BCE - today: The formation of the post-Minoan Kammeni islands, is recorded by human observation and documented by historians. The ancient writer Strabo is the first to mention volcanic eruptions inside the caldera and described the rising of a new small island during the year 197 BCE. After that, at least 8 eruptive phases followed . 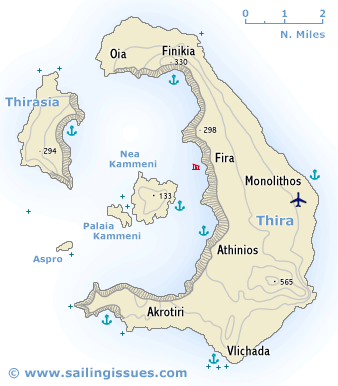 In antiquity Thera was known as Kalliste (the Fairest island) or Strongyle (the Round island) and was inhabited in the 3rd millennium BCE (Cycladic culture), probably by Carians. Archaean Greeks settled on the island about 1900 BCE, but were driven out by Phoenicians. The excavations at Akrotiri have shown that Santorini was flourishing and prosperous place in the first half of the 2nd millennium BCE. It was in contact with Minoan Crete but had developed a distinctive culture of its own. It can be supposed that at least the city of Akrotiri was not ruled by some central authority but by a plutocracy of merchants and shipowners who had trading links reaching as far afield as Libya. This trade, and perhaps also an ethnic connection with North Africa, can be deduced from the wall-paintings of astonishingly high artistic quality, which are now in the National Archaeological Museum in Athens as well as in Fira. The Golden Age ended with the eruption of the volcano, which seems to have taken place in the mid 15th c. BCE, after premonitory activity in the 16th c. It must have been many times more violent than the Krakatoa eruption of 1883. A number of archaeologists, in particular Spyridon Marinatos, believe that it explains the sudden end of the Minoan cities on Crete. After the eruption Santorini remained uninhabited for 500 years, until the beginning of the 1st millennium BCE, when it was resettled by Dorian (Minoan) incomers from Crete, who established themselves on a limestone ridge south-east of Mount Profitis Ilias. In 630 BCE their king, Grinos, founded a colony at Kyrene - the largest Greek colony in North Africa. Allied with Sparta at the beginning of the Peloponnesian War, Santorini was required to pay tribute to Athens from 427/426 BCE onwards. It enjoyed a measure of prosperity under the Ptolemies, when an Egyptian garrison was stationed on the island. Thereafter it came under Roman rule. In 1207, after the Fourth Crusade, Santorini was conquered by Marco Sanudo, Duke of Naxos, and thereafter remained in Italian hands for three centuries. In 1539 Santorini was taken by the Turks; in 1830 reunited with Greece. The volcanic force which originally built up the island round the older limestone cone of Mount Profitis Ilias and then destroyed it shortly after 1500 BCE continued to manifest itself in later centuries. The last violent volcanic phenomena, combined with earth tremors causing considerable damage, took place in 1956. In the night of 6 April 2007 the cruise ship Sea Diamond sank near the mooring buoy beneath Fira town (Skala) after hitting a reef - just south of Kammeni islet - inside the flooded crater of this volcano and making water. The weather and visibility were ideal and these waters are well charted. On the photo on the right she is already listing while passengers are evacuated by rescue boats. With a dramatic slow movement the Sea Diamond sank nose-up surrounded by liferafts to a depth of 200 metres ending on the rocky seabed of the Santorini caldera. Several cruise ships each days visit Thira in the season. BBC News: 1, 2, 3. The strong volcanic soil seems to deliver a faint smoky bouquet to the famous local Santorini wines. The grapevines are pruned in a distinctive way to encourage them to twine around in a basket shape called a stefani. This preserves the scant moisture and protects the vines from the omnipresent winds that scour the surface of these treeless slopes. 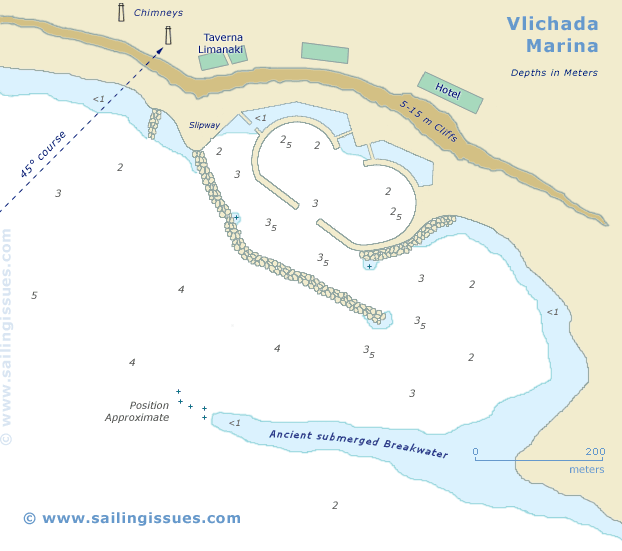 The uncompleted marina of Vlichada (Vlikada or Vlikadha) at the south tip of Santorini is regarded as the only port where you can safely moor the yacht during storms or leave the yacht unattended whilst exploring the islands. It has been unfinished for many years, but since summer 2009 - and some ungoing additions since 2017 - most of the planned facilities can finally be appreciated. The marina was subsidized by the European Union for 3,5 million Euros to attract visiting cruising yachts, either private or chartered yachts. Important: the approach is rather treacherous with two submerged ancient moles blocking the most logical way in. To avoid these and other obstacles: steer a course of 45° towards any point between the chimneys and the blue hotel till you see the entrance of the marina at 90°. Note, that lots of charts and guides erroneously mention only one breakwater. And although the northern one (not indicated in the map below) is much shorter and not the dangerous one, it is certainly there! Once inside, you still need a watchful eye since the entrance is quite often badly silted up and a nasty submerged block awaits you at your starboard side. The new lighted yellow buoy reported in several guides is often (re)placed rather randomly: don't rely on its position, its colour or even its existence. However, and this is a huge however, the Vlichada marina is nearly always fully packed - even in the shoulder seasons - with local daily cruisers (catamaran). Visiting yachts are very rarely welcomed. Moreover, due to winter storms the entrance silts up badly and each year an extensive dredging operation is required to keep the harbour as well as the entrance at a depth of 3 metres minimum - expect depths of much less than 2,5 metres. For most yachts the marina is not accessible, even if there was a berth available. Solutions: 1) anchor at Akrotiri (use a tripline) or 2) drop anchor over the ancient mole and go stern-to but not too close to the southern modern quay (use the dinghy to get to shore). Be sure to use a weight on your anchor chain to not obstruct the entrance. Locals in Oia, in Ammoudi and opposite in Thirasia have buoys for their boats or for safety reasons or to rent. A good size dinghy and a strong outboard are vital here. The large iron buoys under Oia can potentially be very dangerous for smaller yachts. There is also a buoy under Fira but the port authorities and the locals will not allow you to moor there. The local rent-a-bike will bring scooters right to your yacht. Indeed the best way to explore Santorini is by scooter or motorbike. Usually, you will be able to shower at the Notos Hotel which overlooks the marina. The dishes served at the nearby Taverna Limanaki are truly delicious.